A Practical Proposal for Designing, Testing and Certification Phased Array Probes Used in Nuclear Applications. Inspection and Maintenance Services (IMS) of Ontario Power Generation Inc. designed over a period of 8 years more than 150 phased array probes for turbine components inspection. The probes were manufactured by Imasonic-France. Both companies developed quality testing procedures to assure the phased array probes perform in a reliable and repeatable manner. This paper presents a new proposal for probe design, testing and certification in different stages: simulation, general features specific features manufacturing QA program/testing features end-user (lab, pre-field, on-the-job and post-field) testing program. Emphasis is given to probe replacement tolerances in a batch of 3-17 probes (same or similar characteristics). A standardized request form for probe design and a standardized checking sheet will be presented as proposal for a better co-operation between the probe manufacturer and the end user. Probe characterization aspects are discussed and a proposal (conceptual ideas) is made to meet the equipment substitution requirements and assure a high repeatability for a batch of phased array probes. The advantages of piezo-composites materials [1, 2] led to a large manufacturing diversity of phased array probes. 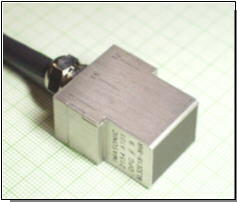 The most common-used are 1-D planar linear array probes. Their application for detection and sizing fatigue and stress corrosion cracks in low-pressure turbine is governed by specific demands, such as: high productivity, high reliability, harsh environment, probe resistance to wearing, mechanics stress, water ingress, mechanical falls, long cable (7-10 mm) and special design due to component configuration to be inspected. Some technical aspects related to probe requirements were presented at WCNDT [3, 4] and EPRI PA Seminar . Meanwhile, Inspection and Maintenance Services of Ontario Power Generation (IMS-OPG) expanded the PA inspection for large-scale inspection of multiple rotors and components. These inspections are carried with multiples automatic systems using 6 to 8 identical probes and 2-4 spare ones [6 - 8]. These applications require new quality level to improve and standardize the design, certification and phased array probe testing (characterization). Reproducibility and reliability of phased array probes are vital features for a reliable and high-productivity in-situ inspection. Other authors [9-14] presented the influence of different factors (wedge design, number of dead elements, beam features commended by the focal laws -set-up or just raised questions about probe characterization issues/methods/what features must be checked). This paper is presenting OPG-Imasonic quality assurance phases and the conceptual ideas related to phased array probes: design requirements, probe testing and certification (manufacturer), probe characterization (end user), probe checking in the field (on the job/ after the job). A proposal for phased array probe standardization is also presented. The first part of this paper is based on a large database of experimental evaluation for 1-D plan linear probes and Imasonic experience in manufacturing and certification of other phased array probes (2-D, annular, segmented annular and complex design-Fermat surface). The paper invites other probe manufacturers, end users and standardization organizations to contribute with their ideas in editing an international standard for phased array probe characterization from design phase to after-job checking. Beam Modeling: The probe modeling is done by O.P.G., with PASS / CIVA software. The target parameters of this modeling are inspection depth, lateral and axial resolution, according to various inspections angles. Probes are also designed to avoid grating lobes or secondary lobes that may generate unexpected parasitic echoes. Imasonic checks this design with in house software QuickSonic that allows a very quick check of the basic parameters of a linear phased array probe. If necessary, Imasonic may also confirm the design with CIVA software, developed by CEA (France) - see Figure 1 a,b. This very complete software allows accurate beam simulation and interaction with defined defects. Figure 1: Examples of beam modeling using PASS (a), QuickSonic/ CIVA- (b) and piezo-composite finite element modeling (c). The piezo composite material: A specially designed piezo-composite material 1-3 structure is implemented in each type of probe. Finite element model and in-house experience (see Figure 1c) are used for the best design fit of the piezo-composite. The composite components and geometry are defined according to the temporal and frequency response specifications, while keeping high sensitivity and signal to noise ratio level. The piezo-composite material is also designed to lower the cross coupling between neighbor elements, which is necessary to properly steer the beam with electronic delay laws. Typical cross coupling is lower than -40dB. The matching layer: Taking into account the using conditions of the probe (manual, automated, direct contact, contact with a wedge), the matching layer is designed to optimize the energy transfer, to shorten the pulse length and to be wear resistant. The backing material: The backing material is designed to shorten the pulse length and attenuate the back echo. Specially designed backing materials allow interesting compromise with high damping and high attenuation in reduced dimension. The cable: The cable performances are also a key parameter for the overall performances of the probe. Its attenuation must be as low as possible, mainly for high frequency probes. Its electrical impedance is matched to probe and electronic characteristics. The bending capability is optimized to access small areas, while keeping high mechanical resistance and constant electrical properties. KLM Model: The electro-acoustical influence of all these components is simulated with software based on KLM model. The target parameters are temporal and spectral response, sensitivity and electrical impedance (see Figure 2). Figure 2: Example of KLM model simulation results. Combined with this software, Imasonic databases on piezo composite material allow precise simulation and very predictable electro-acoustical performances. Mechanical design: OPG issued mechanical specifications for each probe based on part geometry and manipulator holding device. These specifications include overall dimensions, particular geometry requirements, and cable output position. Imasonic validate this design or propose modifications to OPG to guarantee a high mechanical resistance and water tightness under 50cm of water. Hard face: Several probes are used manually or automatically in direct contact, which is very aggressive for the front face. The wear of the front face may have unexpected consequences on the probes like water penetration in the probe or modification of electro acoustical properties. In the meantime, the implementation of a protective layer on the front face may alter the pulse length and sensitivity due to the additional interface. For this reason, Imasonic implemented a new hard face material l/4 materials that combine appropriate acoustical impedance for high-energy transfer. OPG tested wear resistance, which was 10 times higher than conventional front face. Figure 3: Example of phased array probe specification sheet. Yellow fields are probe features, which must be double-checked by Imsasonic and OPG. The probe drawings are elaborated either by OPG or Imasonic (see examples in Figure 4) and approved by OPG after a technical discussion with Imasonic. Useful information and drawing about inspection part and possible set-up may contribute for optimizing the probe features. Figure 4: Examples of probe case design for different probes. A very useful guide for probe design, generic features and practical tolerances, is presented in RD/Tech Guideline book . The probes are designed and manufactured according to Quality Assurance system of Imasonic, which is ISO 9001 certified since January 1998. Characterization process: All probes are checked according to internal procedures and periodically calibrated equipment linked to traceable standards. The goal of these procedures is to test during the manufacturing and the final control the performances of the probe that can guarantee the specified performances in the specified using configuration. An example of probe performances for individual elements and maximum variation within a batch of five probes ( nr. 9) is presented in Table 1 and Figure 5. Figure 5: Sensitivity variation between the maximum and minimum values for probe # 9, 9A-9D. 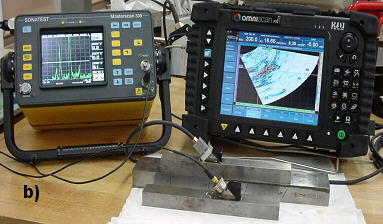 Imasonic Quality Department is delivering the probe only after all OPG and in-house specifications were fulfilled. The probe certificate contains the probe specifications sheet, special requirements (if any), probe drawing at scale 1:1 and 2:1 and measurement results on all elements. Figure 6: Main probe features checked at the receiving. Figure 7: Probe features to be checked in the lab. The numbers from the brackets are acceptable tolerances for probe substitution in the same family. Examples of lab probe evaluation are presented in Figure 8. Figure 8: Examples of focal depth and index point migration evaluation by OPG. Figure 9: Probe features to be checked before and on the job. Figure 10: Probe features to be checked after the job. Figure 11: Probe price dependence on probe number for a standardized PA probe (a) and example of machine / probe cost ratio for conventional and PA systems (b). Once a phased array probe standard / recommended practice is in place/approved, the probe certification is much easier to be documented and accepted by the customer / validation center in the inspection / qualification dossier. All factors: manufacturers, end users, regulators, research institutions and validation centers are using the same terminology and similar methods for phased array probe QA documentations. Color-coded frequency: A color-coded standardization, similar with the color used for conventional probe, could be useful for an easy-to-use strategy/avoid field mistakes. The proposal is presented in Figure 12. Figure 12: Proposal for color-coded frequency of phased array probes. Table 2: Example of probe standardization for 16-element 1-D planar linear probes. Minimum probe features to be checked: This is a very important feature of standardization process. What features performed by whom and how often based on what method will be the fundamental questions for the foundation of PA probe standardization. International standards for conventional probes [19-22] could be a good starting point. Acceptance values: The standardization must include acceptance value, at least for nuclear applications. The acceptance values presented by us in different QA stages are related to 1-D planar linear array probes used for low-pressure turbine components. The proposal for standardization must be discussed and accepted by all major participants in the phased array inspection process. It is not our mission to impose or suggest the standardization of the features we presented in different phases. OPG tolerances on probe features are derivate from the necessity to find and size small defects in low-pressure components. The accuracy in sizing and location in these components is more stringent that PDI ones  (see Table 3). Transferring these tolerances from the low-pressure turbine to pressure boundary welds must be made based on guidelines, recommended practices and a technical justification. EPRI phased array qualification process for weld inspection is based on dual / single 2-D matrix probe [24-26]. Essential variables tolerances on phased array probes are based on ASME XI-Appendix VIII-Article 4110 . This paper is inviting you to participate to this process. PA probe standardization will be a time-consuming process, but is worth starting. This task must be delegated to standardization institutions, such as ASTM, ASME, EN, JIS, ISO, and IIW. The technical committee must include experts in phased array technology, including probe manufacturers. EPRI could start a guideline for probe-wedge characterization and substitution for 1-D and 2-D type of PA probes used for weld inspections. One important factor, which contributed to a high reliability of OPG results in detecting and sizing linear defects in turbine components [8, 23], was the PA probe performances checking and certification (from design to the field test). Extending the phased array technology to pressure boundary welds will require standardization of the probe features and over-all system performance testing. The probe/PA machine interchanging (same family) should not affect the procedure qualification. Similar studies performed for conventional ultrasonic inspection  on equipment influence on linear defect detection and sizing must be performed for phased array probes (1-D, 2-D) shear/longitudinal waves, before realistic tolerances are standardized. The PA probe standardization should commence with a common understanding of probe technical specifications: what features are the most critical for probe repeatability. Example OPG-Imasonic probe specification could be diversified and standardized for different type of probes. The basic features should be the same. The authors wish to thank Inspection and Maintenance Services - Ontario Power Generation - Management for granting the publication and presentation of specific probe data and field inspection pictures. Poguet, J., Ciorau, P.: "Reproducibility and reliability of NDT phased array probes-part 2" -16-th WCNDT, Montreal, Aug 30-Sept.03, 2004. Wüstenberg, H., Erhard, A., Schenk, G.: "Some characteristics parameters of ultrasonic phased array probes and equipments", NDT.net, vol.4, no.4 (April 1999). ***R/D Tech: "Introduction to phased array ultrasonic technology applications-RD Tech Guideline"-Quebéc, Canada, August 2004, pp.137-153"
Selby, G., MacDonald, M., Landrum, J., Dennis, M.:"Phased array technologies for nuclear pipe inspection productivity and reliability" - 3-rd International Conference on NDE in Relation to Structural Integrity for Nuclear and Pressurised Components-Seville, Spain, Nov.14-16, 2001.